What is an ear wound? Simply put, an ear wound is a cut of the ear. The injury can involve only the skin or be more complicated by injury to the underlying cartilage. If the cartilage is damaged it will need to be repaired to achieve the best cosmetic appearance. A common example of an ear wound is a torn earlobe. 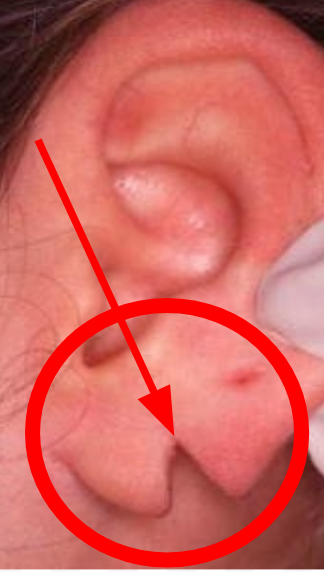 How do ear wounds occur? Ear lacerations are commonly encountered from trauma, often related to sporting injuries or animal bites. If they occur in the workplace, they are usually considered to be work-related injury. Read more about our Workers Compensation Plastic Surgeon. How to treat ear wounds? Expedient wound care and closure ensures the best outcome. Treatment may include simple cleaning and bandaging of the laceration or repair with sutures (“stitches”). If the cartilage is involved, absorbable sutures are placed in the cartilage to repair the defect. Complicated ear lacerations may require plastic surgery. Ear lacerations should be repaired within 12 hours to prevent infection. While waiting for treatment, the laceration can be cleaned with running water and covered with gauze or a clean cloth. Pressure on the wound can be applied to stop bleeding. If the bleeding is profuse consider calling 911. A tetanus shot may be recommended, depending on when the last vaccination was received. Torn earlobes – also known as split earlobes – are one of the most common types of ear injury. It used to be believed that trauma or heavy earrings were the main cause of torn earlobes. Indeed, trauma (such as contact sports) can cause such injuries. However, in a study conducted on 25 patients, it occurred that heavy earrings may not be such an important factor as previously thought. The study revealed that heavy earrings usually just lead to stretched earlobes, not torn earlobes. It may be that an allergic reaction to the metal earring / piercing is the real underlying cause of torn earlobes. How to treat torn earlobes? Are there any non-surgical treatment options for a torn earlobe? Unfortunately not. Surgery is almost always required – this is known as an ‘earlobe repair’. The good news is that earlobe repairs can be done under local anesthetic and the procedure usually takes no longer than 15 minutes. If you would like further information about plastic surgery for ears, please Contact Us to schedule a consultation with Dr. Zaydon today!